În perioada 11 ianuarie – 4 februarie 2018, Primăria Capitalei prin creart – Centrul de Creație, Artă și Tradiție al Municipiului București, organizează în Galeria creart din Piața Alexandru Lahovari nr. 7, expoziția „Why Go Outside When Everything Happens Inside My Head” de Andreea Chirică, curatoriată de Eugen Rădescu. Vernisajul expoziției are loc pe 11 ianuarie 2018, la ora 19:00, iar intrarea este liberă. “Why go outside when everything happens inside my head” is an illustrated monologue on the conflict between the gregarious, reachable, always with your phone fully charged being and the OUT-OF-REACH emotional being. By contrast, vulnerability, fear, conflict is encapsulated into a moving plastic frame, paper and sponge. The space is filled with pieces of paper, covered with thoughts, a kind of dadaist exercise, an automatic dictation, forcing you to look around without revealing the details. A frivolous portrayal – WOW, FUN, LOL – easy to digest, easy to forget of the invisible life, that performs beyond the small or big screen, but never completely disconnected. 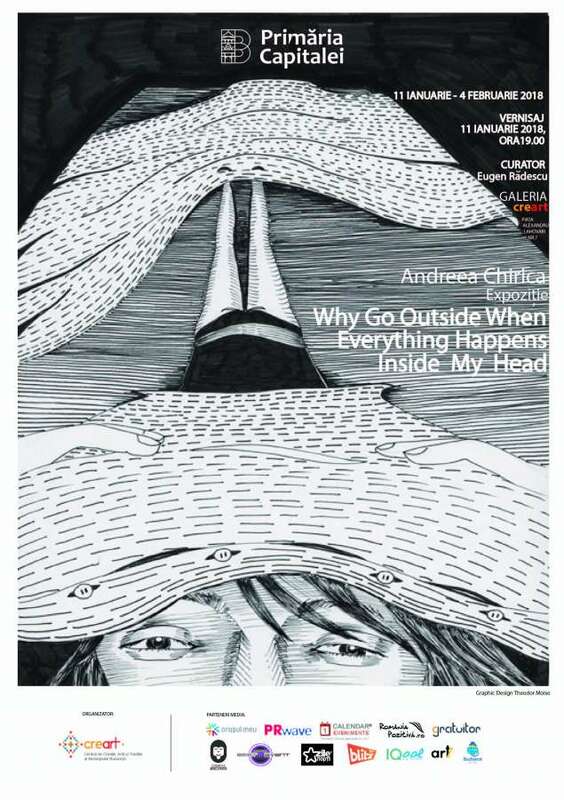 Andreea Chirică is an artist and graphic novelist. In 2011 she published her first graphic novel: The Year of the Pioneer, and she participated at ComicCon New York and Barcelona. She collaborates with DOR Magazine, Scena9 and recently she illustrated the Răzvan Exarhu essays collection. She was part of ComiXConnection exhibition, “Shrinking Cities” exhibition at MNAC, Muzeul Bucureștiului, European Salon of Comic Book (2016), Mora Art Centre, Bucharest. The second book, “Home alone”, was selected for the main exhibition at the Romanian Design Week and won the illustration prize at “Cele mai frumoase carti din Romania” contest. The next exhibition will be at Visual Kontakt Gallery in Cluj-Napoca. She keeps an online drawing diary on instagram.com/persoana_fizica. Eugen Rădescu is a cultural manager, curator and theoretician, with background in political science (specialised on moral relativism and political ethics). He wrote for various magazines and newspapers. He curated, among others, Bucharest Biennale 1 with the theme “Identity Factories”, “How Innocent Is That?” , “presently i have nothing to show and i’m showing it!” and „Common Nostalgia” at Pavilion Bucharest. He published the book “How Innocent Is That?” at Revolver Book Berlin. He is co-editor of PAVILION – journal for politics and culture and co-director of Bucharest Biennale (with Răzvan Ion) and the chairman of the organisational board of PAVILION and BUCHAREST BIENNALE. He is member of the selection board at apexart for the programs „Franchise” and „Unsolicited Proposal Program”. He held different lectures at several institutions such as apex, New York, Badisher Kunstverein, Karlshrue, Casa Encedida, Madrid, University of Arts, Cluj. Currently he is working on a new book, “Moral relativism – two perspectives”. He is Phd in political science at Babeș-Bolyai University. Also he is professor at Bucharest University and Babeș-Bolyai University, Cluj. Lives and works in Bucharest.